If you use zero clearance inserts, adding a table saw splitter directly to the insert is an effective method of preventing kickback when ripping stock on your table saw. Although there are certainly many causes for kickback, probably the most dangerous occurrence happens when the wood closes together as it passes behind the blade. The upwardly rotating rear teeth at the back of the blade can catch the workpiece and throw it back violently in the direction of the operator. To prevent this from happening, table saw manufacturers install splitters behind the blade to keep the kerf open and let the workpiece pass safely by the blade. Other safety devices like anti-kickback pawls and a blade guard are usually attached to the splitter as well. A typical contractor table saw splitter assembly showing the anti kickback pawls. The blade guard is lifted up out of view in this photo. Although these splitter assemblies work, they have their problems. Some are so flimsy they need to be bent back into position every time they're reinstalled. Others are just plain hard to line up and almost all of them are thinner than the blade is wide. The photo on the right shows the stock splitter for my contractor saw. Although this splitter assembly works fairly well most of the time, it is only .082" thick, which is almost ten thousandths of an inch thinner than my ripping blade (shown) and forty thousandths thinner than my combination blade. Trying to rip a workpiece with either blade when the wood wants to close up behind the blade will cause problems. With the ripping blade it will probably be limited to minor burning and a rough cut, but with the combination blade, the kerf can close enough that the workpiece will want to lift at the back of the blade. If this happens before the wood is under the pawls, the workpiece could come flying back. 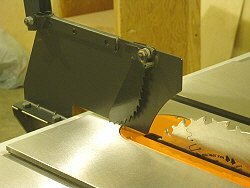 A properly designed table saw splitter should be as wide as the kerf left by the blade, effectively eliminating burning and rough cuts and severely lessening the chances of kickback. This can be easily accomplished by making your own splitters and inserts or by using an aftermarket splitter to replace the stock unit. It's foolhardy to work without some kind of splitter in place when ripping. Kickback can happen fast and the consequences can be life changing. If you haven't been using your stock splitter assembly because it's a pain to use, consider one of these alternatives. If you make your own zero clearance inserts out of wood, it's easy enough to extend the blade slot and then glue in a wooden splitter that's the same width as the slot's kerf. You can make these custom splitter/zero clearance inserts for each blade you use for ripping. Since the whole idea here is to have the splitter directly in line with the blade, it's important that the zero clearance insert is a fairly nice fit in the table opening. 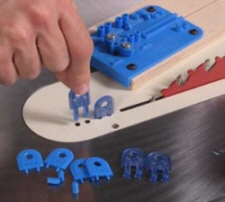 A sloppy insert can be shimmed with tape or screws could be set into one side and adjusted to remove the excess play. Any shimming should be done before the slot is extended for the wooden splitter. Set the fence with the blade centered in the insert slot. Extend the slot in the insert to make room for the splitter. To cut the slot for the splitter after the slot is cut for the blade, re-insert your stock throat plate and slip the zero clearance insert over the blade on top of the throat plate. Slide your fence over until it contacts squarely with the insert along it's length. With the insert against the fence, the blade should turn freely in the insert's slot. The wooden splitter is glued into the slot in the insert. Now, with the blade perfectly in line with the slot, the slot can be extended to make room for the splitter to be glued in. I usually extend the slot right into the existing slot, allowing me to place the splitter anywhere along the kerf. The splitter is most effective when it's sitting as close to the back of the blade as possible, and because the saw's arbor rotates in an arc, a compromise will have to be made to allow for different blade heights. The easiest solution is to make more than one insert/splitter combo per blade. For me, since I seldom use my combination blade for ripping anything over 1", I use one insert/splitter for this blade with the splitter sitting directly behind the blade when it's set for cutting 1" material. For ripping thicker material and for resawing, I stick with my ripping blade. For this blade I have three different insert/splitters with the splitter location optimized for blade heights from 1" to maximum height. These two blades and four insert cover all of my ripping requirements. Ripping a 3/4" board to width. The splitter itself should be made from hardwood. The ones I make are generally 1 - 1 1/2" long with a maximum of 1 1/2" in height above the insert. The narrower the blade, the less height I give the splitter. The thickness depends on the width of the kerf left by the blade you're making the splitter for. I try to rip a length a few thousandths thicker and sand to final thickness, giving me a nice snug fit in the slot and a smooth surface on the sides of the splitter. It's a good idea to taper in both sides of the leading edge in case the wood starts to close up before it hits the splitter. 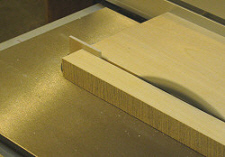 A knife edge will allow the splitter to open the kerf without the wood hanging up on it. Although they last quite a while, if your shop made table saw splitter does get damaged, simply cut it out by cutting a new slot and glue in a new one. The aftermarket often comes to the rescue when manufacturers come up short. When it comes to table saw splitters, one of the better looking options out there is made by a company called Micro Jig . Micro Jig table saw splitter system for 1/8" kerf. Although I have no experiece with them, they look to be an excellent alternative to the stock style splitter and I've heard nothing but good reviews on woodworking forums from other woodworkers. At this writing, they seem to have models to cover three kerf sizes. The standard kit is all plastic while the pro kit has a plastic covered steel core. Both kits come with a jig for mounting the splitters and a drill bit for drilling the holes. The steel cored kit sounds a little more robust to me and for the few extra dollars involved, would be the way I'd go. They'll only work with zero clearance inserts though, so you'll have to make your own or buy blanks made for your particular table saw. If you don't want to make your own table saw splitter, this looks to be a pretty cheap and effective alternative.